That’s traditional media. Is digital doomed to the same fate? Will digital brands keep making mistakes like PepsiGate? Can digital branded content ever be taken seriously, even as seriously as journalism? 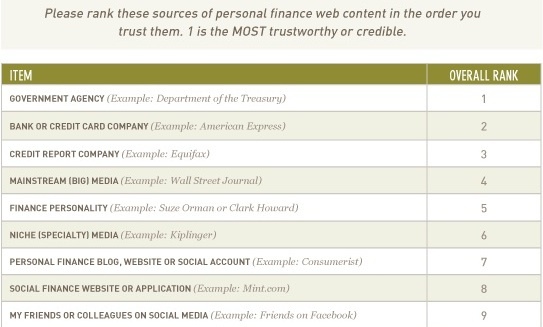 We found Americans are quite open to brands being credible sources of web content. For example, when we asked study participants to rank financial content sources in order of credibility, a company or brand ranked second, beating out big media and other source types. That result astounds me when I think about the credibility challenges faced by the scandal-ridden financial industry. But, we found the same was true for the health and travel industries, too. Those three industries are so different from each other, it’s not a stretch to think this insight also applies to other industries. What does this insight mean for you, as content marketers? Big opportunity. People want to hear from you. Americans are not opposed to brands being sources of content. Well, that sounds easy enough, right? Here’s the rub. Our applied research finds content execution matters to digital credibility. A lot. While people are open to companies and brands as credible sources in theory, in practice people rated other sources of digital content as more credible. 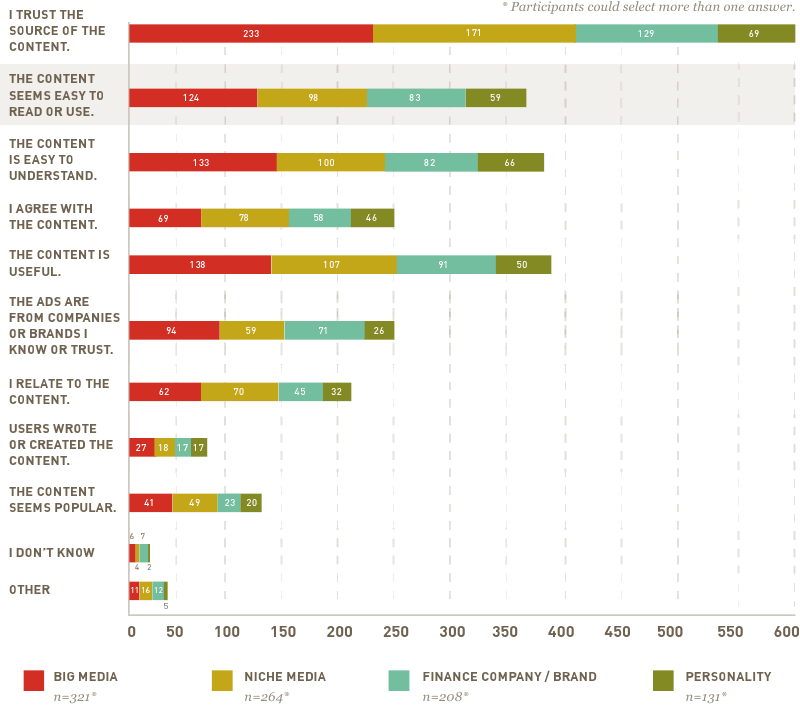 For example, when research participants rated different samples of finance content, they rated content from big media the highest in credibility. This discrepancy means the problem with branded content credibility isn’t the concept. It’s the execution. Your challenge, then, is to improve the credibility of your branded content execution. Let’s look at three research-based ways to give your digital branded content more clout. We’ve known since 2002 that appearing credible is important. (For a refresher, take a look at this study sponsored by Consumer Reports.) But, my firm’s research finds digital credibility is about more than looks. It’s about identity. Don’t assume everyone who comes across your content knows your brand is the source. In our research, if participants had any doubt about who or what the content source was, they rated the credibility of that content sample lower. And, among samples of content that our participants rated as “not credible,” uncertainty of the source’s identity was the number two reason why. So, make your brand name, logo, and tagline obvious. Getting this basic right will take you far. But how do you make your brand’s identity unmistakable? Voice. When so much content is text, you need a verbal identity as strong as your visual identity. Voice is your verbal identity. When your content sounds like your brand, even when visual cues are limited (think SMS, for example) people can recognize you faster. The foundation for voice is point of view. How does your brand see the world? What does your brand stand for? From your brand viewpoint flows your brand voice. To bring it to life, don’t list a bunch of tired adjectives. Think about how that voice should make people feel and list examples. Should your brand make people feel wiser, like they’ve just hung out with their favorite mentor? Or cooler, like they just spent time with a hip friend who knows what’s in and what’s out? How would a favorite mentor or a hip friend talk? That’s your start on voice. I could go on, but you get the idea. Voice sounds abstract, but the next way to give your branded content more clout is much more concrete. If your content seems sloppy, customers will be slower to listen to you and to trust you. Get the details right. For part of our research, we observed people look for answers to questions about health, finance, and travel. I was astounded at how closely participants read metadata listed in search engine results. If that metadata was unintelligible or not clear, especially for an unfamiliar brand, participants would not click on the listing. Get your page titles and metadata descriptions in order. Our research found that typos, factual errors, and inconsistencies will make people more likely to verify your content. That means people will consult other sources of content and won’t count on your content as the definitive word. And, that means people will be more likely to come across your competitors or, worse, give up altogether. We asked participants to rank what helps them decide whether to trust content. They ranked references highly. If you’re a new brand, especially, references that your prospective customers already trust will go a long way toward building your clout. Don’t have time or resources to polish content, you say? Take some of that budget you’re wasting on display advertising and put it toward better quality content. In our research, we asked participants who rated content samples as credible to tell us why. The second most frequent reason? The content is useful. You can’t shortcut usefulness. Appearing to be easy to read with white space and bulleted lists or using a “3 ways to x” formula like the one I’m using here doesn’t guarantee usefulness. Usefulness is about whether your content truly means something to the people you’re trying to reach. Does your branded content really answer their questions or guide them through tough decisions? Does your branded content avoid rehashing the obvious and thoughtfully meet your customers’ needs? If yes, you’re well on your way to making content useful. When people find your content useful, they’ll be more likely to recommend it to others online and off. In our research, participants reported that recommendations both from experts and from people they know (friends, colleagues, etc.) help them decide whether to trust content. For a new brand, a recommendation will lead people to trust you faster, short cutting their normal approach to verifying what you say. Make sure your content connects well with social media so people can recommend your branded content online. When you make your digital branded content easier to recognize, more polished, and more useful, your brand becomes a trusted advisor in the eyes of your customers. With so many companies not doing digital branded content — or doing it wrong — doing digital branded content right will distinguish you as an authority. You don’t buy authority, but rather you earn it with the right content approach. Your brand might not get name-dropped by Channing Tatum or Jonah Hill, but I predict you will get a jump on brand reach, reputation, and results. In the end, isn’t that what every marketer, content or not, wants? Colleen is the author of Clout (New Riders) and the principal of Content Science, a boutique consulting firm in Atlanta, GA. As a pioneer of user experience and content strategy, Colleen has guided or supported strategic initiatives for a wide range of organizations including Equifax, InterContinental Hotels Group, Centers for Disease Control and Prevention, and Cingular Wireless (now AT&T). Her upcoming eBook, "Does Your Content Work?" will be released in 2014. Follow her on Twitter at @leenjones.